It's the last post of 2017, friends! I hope you've achieved all of your goals this year (if not, your fresh start is just around the corner with 2018 swooping in!). Is one of your goals to learn more about watercolor? Maybe even make a go at selling a few of them? I've SO got you covered. Next year I will be doing a series on working with clients and selling your artwork, so go on and hit that subscribe button so you don't miss out. If you've been keeping up with my posts, you should have your paints, palette, and watercolor paper ready to go. If you missed them, go back and take a look! Materials make SUCH a huge difference in the quality of your work, and using the right ones can make painting so much easier. Today we are going to learn about different watercolor brush shapes, synthetic sable vs squirrel hair, and which brushes I keep in my arsenal! Pictured you will find a quick reference guide for each brush shape I am going to cover, and see a few strokes you can make with each shape. Round brushes are the QUEEN of watercolor brushes. I always keep a #16, #12, #10, #4, and #2 on hand - let's be honest though, I basically have one in every size. Depending on your style of painting, materials are super critical here. The most popular two materials for watercolor are sable hair and squirrel hair. I have synthetic versions of both materials, as buying real kolinsky sable and squirrel is hella expensive and, in my opinion, completely unnecessary. My absolute FAVORITES (cue the heart eyes emoji) are the Princeton Heritage 4050R Synthetic Sable brushes. 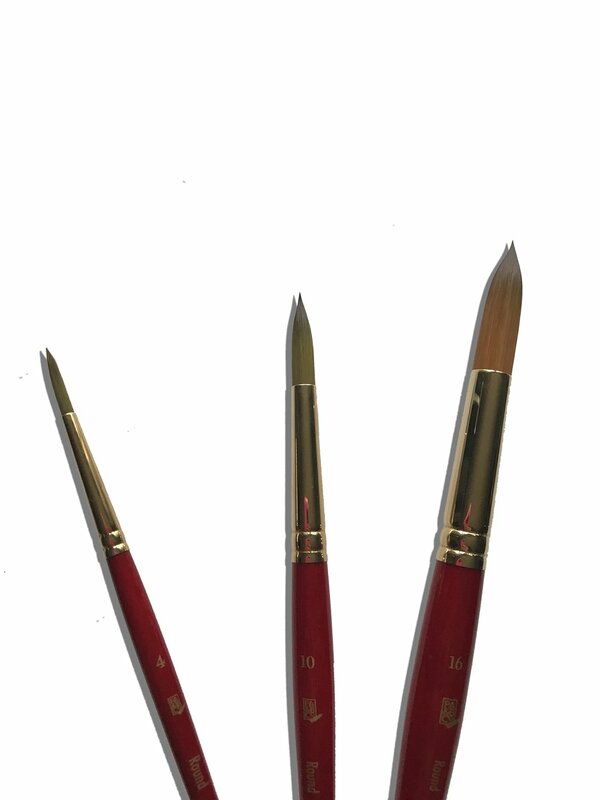 These are pointed brushes with amazing spring (meaning you can press down while painting and they spring right on back to their original shape when you lift up), so you are able to transition between wide strokes and thin strokes very easily. They also hold quite a bit of pigment and water in their belly. Brushes that hold a lot of water are ideal when you are painting larger areas, as they will last longer without you having to rewet your brush and pick up more pigment. I always use my Heritage brushes for leaves, because I can create a thin stroke for the stem, and then a large leaf shape by pressing and lifting the brush. The best part? They are super affordable! I always buy these through Blick Art Materials, and a Round #12 is under $10 (for comparison's sake, a REAL Kolinsky Sable #12 made by Princeton is $47). If you refer to the guide, you can see the demo of a #16 and #10 (both in yellow). I also use the Princeton Neptune Synthetic Squirrel Hair round brushes. The main difference here is the spring. Squirrel hair doesn't have nearly as much spring as sable, so the brush is kinda floppy. You can't get as fine of a point as you can with the Heritage line (checkout the purple strokes on the guide compared to the yellows), but this can be useful when you are working on small, round florals (like lavender) or trees. These hold more water than the Heritage brushes, so they are great for large washes. A Neptune Round #12 is also under $10, and they are priced very similar to the Heritage line. I have tried many affordable brands of round brushes, and there is one other brand that I have found useful: Mimik Kolinsky. In regards to spring, I'd say these are between the Princeton Heritage and the Neptune. The Mimik is not pointed like the Heritage, but they do hold their shape better than the Neptune. This can actually be useful when you are switching back and forth between thin and thick strokes, and don't want quite as pointy of a line as the Heritage provides (you can see the roundness in the stroke in my guide - Mimik is in green). I have a #12 and #8, and I purchased them at Jerry's Artarama. I liked that you could actually buy them IN Jerry's, so you don't have to worry about shipping, and the price was under $13 for a #12 with the 10% VIP discount. If you're stocking up on brushes, you can't go wrong with a variety of round brush sizes and types. These brushes are ideal for portraits and foliage work. Their rounded edge allows for soft blending. I very rarely use these brushes as I find a round brush to be more versatile, but I do like to keep one on hand just in case. The one pictured is a synthetic sable Holbein Gold #6. These can be hard to come by. I picked mine up at an art show for around $6. Princeton also makes some synthetic filberts (not in the Heritage series, but the Elite and Snap! lines have them). In the guide, the filbert is at the very top in red. As you can see, you can make some neat strokes with them. If you're feeling like you want a variety of brush shapes, it wouldn't hurt to pick up one of these, but you can absolutely work without them. Square flats are useful when you are trying to get fine edges or create large washes. Again, the Neptune series is great for washes, since it holds more water and pigment. I have a Princeton Neptune Flat Wash 3/4" for this purpose (under $14 with Blick Art Materials). Check out the square strokes I made with this brush in pink on the guide. If you're looking for fine edges, I would recommend grabbing flats in the Princeton Heritage series. I find their flat shaders useful for creating bricks in house paintings. The downside to square brushes is that you don't get much variety in stroke size. You are limited to a thin stroke or a wide stroke. Quill brushes are mops that come to a fine point. Mops hold a crazy amount of water and pigment and can be very useful when you are creating large landscapes. If landscapes are your jam, I would recommend picking up one or two of these in the Neptune series. The quills in the Heritage series would give you a finer point, but they won't hold as much water (which kinda defeats the purpose, right?). The Neptune quills are on the pricier side (starting around $17 for a #4), but worth having if you're consistently alternating between very large washes and fine details. These bad boys are also known as riggers or script brushes. They are perfect for creating, you guessed it, outlines, rigging on boats, and calligraphy. I have a Princeton Heritage and Neptune liner, and find my Heritage liner to be best for creating outlines. I sometimes use it for lettering, but the transition from straight to curved lines can be tricky with the long bristles and great snap. The Neptune liner is a bit easier for small lettering, as it doesn't snap as much when you are creating curved letters. These brushes are also very affordable, coming in under $6 for a Neptune #6 with Blick (this is partially because liners wear out quicker than other brushes, so keep that in mind when purchasing). There are other specialty brush shapes (sword, fan, etc.) that I decided to leave out here, as I don't use them and couldn't honestly speak to their abilities. I have found that you can use a round brush to get the effects of nearly every other type of brush, you just might not be able to do it in one stroke. If you are a newbie and unsure where to start or only want a few brushes, I would highly recommend picking up a couple of different rounds. A #16, #12, #6, and #2 would give you a good variety and meet most of your needs. If you tend to paint with finer details, I would stick with the Princeton Heritage 4050R brushes. If you work looser and don't always need that fine point, you could get a combination of Heritage and Princeton Neptunes. Do you have a favorite shape or brand of brush that I didn't cover? Pop a comment below and let me know! I always love trying out new brushes. Also, if you haven't checked out my post on properly caring for your watercolor artwork, make sure you give it a read. That way you don't mess up any of your pretty new paintings!